Description: Sexes similar. 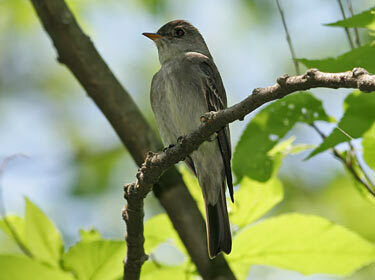 Almost indistinguishable from Western Wood-Pewee except by range and voice. Dark grayish-olive above; dull white throat; dark gray sides and breast; belly, flanks, and undertail coverts whitish or pale yellow; no eye ring. Wing bars whitish in adults, and buffy or pale cinnamon in juveniles. Adults’ bill has black upper mandible and dull orange lower mandible, while juveniles’ are mostly black. Habitat: Usually found in deciduous forests, including floodplain and river-bluff habitats, and also woodlots, orchards, and suburban areas with tree plantings. Where in Nebraska: Common spring and fall migrant and summer resident in eastern part of state. Extends west to Dawes, Cherry, and Dundy Counties along river systems. Regular breeder. Field Notes: No winter records of this bird in the entire United States. Fun Facts: Often uses same perch for flycatching, usually a dead branch about mid-level in the tree. Because of this preference for dead branches they have been nicknamed “dead limb bird”.